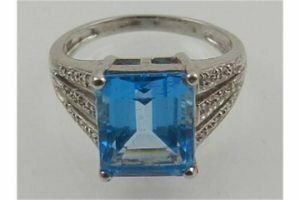 A 9 carat white gold, blue topaz and diamond cocktail ring, set emerald cut stone, the split shoulders set with diamond accents. 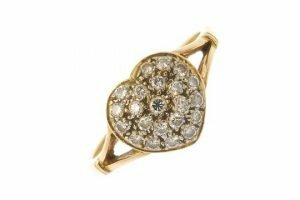 A diamond floral pendant, designed as a brilliant-cut wide collet, within a pave-set diamond petal surround, to the tapered surmount and box-link chain. Estimated total diamond weight 0.40ct. 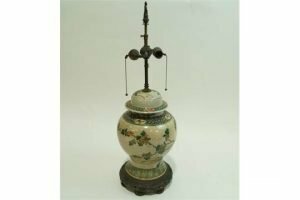 A Chinese crackle glaze vase and a cover, painted in famille verte enamels on pierced metal stand converted as a table lamp, with fittings for two light bulbs. 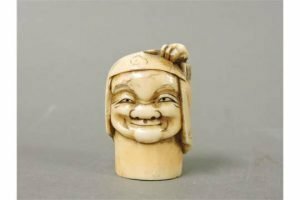 An ivory walking stick pommel, circa 1880, carved as a man smiling as a crab crawls over his headdress. 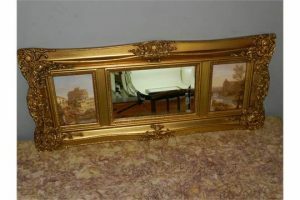 An over mantle triptych mirror, having central mirrored panel flanked with two ceramic plaques, within an ornately carved giltwood frame. 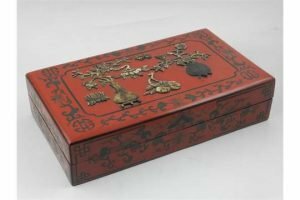 A Chinese red and black lacquered box, of rectangular form, the lid decorated with vases and flowers within a stylised border. 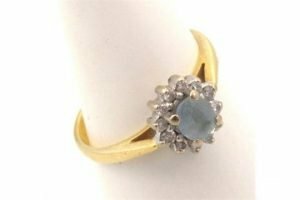 A ladies dress ring, of floral design with central claw set aquamarine surrounded by small diamonds on a part pierced yellow metal shank, marked 750. 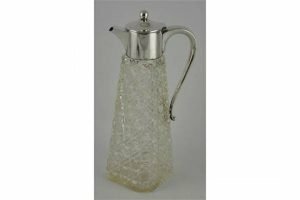 A cut crystal and solid silver topped claret jug, hallmarked London 1973. 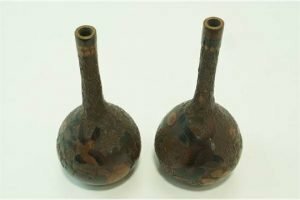 A pair of Japanese porcelain vases, decorated with cloisonné flowers on a textured background. 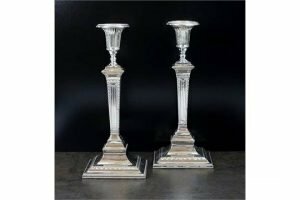 A pair of short white metal candlesticks, each with faceted knopped stem and raised on square base. 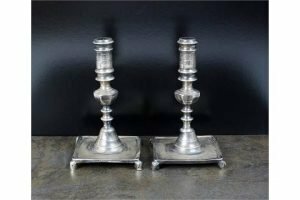 A pair of silver plated candlesticks, the tapering column raised on spreading square base. 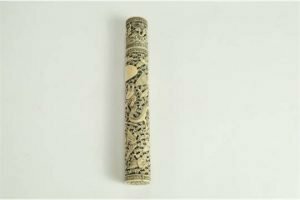 A late 19th century carved ivory Chinese cylindrical bodkin case, with screw top cover. A 9 carat yellow gold and pearl cluster pendant, suspended on a 9 carat yellow gold chain, together with a 9 carat yellow gold and pearl and crossover ring. 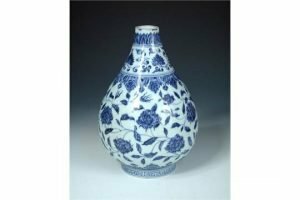 A Ming style blue and white vase, the onion shape painted with scrolling lotus between leaf lappets, a thunder scroll band on the circular foot. 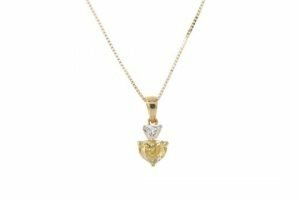 A diamond two-stone pendant, the treated yellow heart-shape diamond, with a heart-shape diamond surmount, suspended from a fine box-link chain. Estimated total diamond weight 0.50ct. 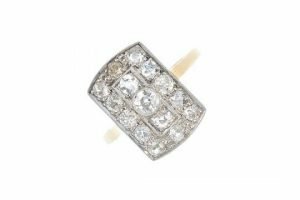 A diamond dress ring, the brilliant-cut diamond sliding collet, within a similarly-cut diamond rectangular-shape surround, to the ridged shoulders and tapered band. 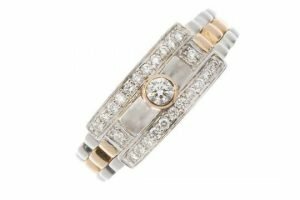 Estimated total diamond weight 0.30ct. 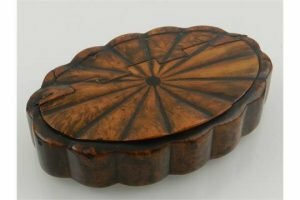 A 19th Century oval fruitwood snuffbox of fanned paterae form, the hinged cover enclosing a tortoiseshell lined interior. 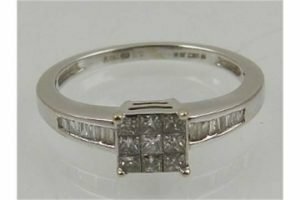 An mid 20th century platinum and 18ct gold diamond dress ring, the old-cut diamond three-stone line, within an old-cut diamond border, to the plain band. Estimated total diamond weight 0.70ct.